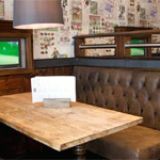 The Cabbage Patch is a traditional public house that proves very popular when there's some sport on, thanks to its big screen and impressive selection of drinks. Do you work at The Cabbage Patch? Covered patio and heated smoking area. What did you think of The Cabbage Patch? The Cabbage Patch is a brilliantly traditional place that made my old man very happy indeed. We sat and drank a few ales and had a very pleasant time indeed - made all the better by the nice staff. Don't be put off by the odd name as the Cabbage Patch is definitely worth a visit. 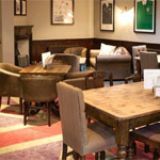 This famous pub close to the home of English rugby union is now part of the Fuller’s stable, with a refurbished interior appealing to a much wider public than its ruggerish reputation suggests. In the first decade of the 20th century, Billy Williams turned his market garden in Twickenham into a rugby pitch that played host to the first England v Wales international. Eventually the site was gifted to the Rugby Football Union and developed into the second biggest stadium in the UK after Wembley – but it’s still known affectionately to fans by the nickhame ‘Billy Williams’ cabbage patch.’ Thus the name of this sprawling pub diagonally opposite Twickenham station and en route to the stadium, a popular rendezvous for before and after match crowds. Fuller’s took over the Cabbage Patch in 2011 and fully refurbished it early in 2012, retaining the rugby theme. Outside a new white paint job has left the building looking rather less forbidding than the previous yellow and black. Inside are several interconnected rooms with a slightly eccentric, loungey feel – aged wooden tables, a mix of seats including some unusual tip-up ones, padded benches and cushions. 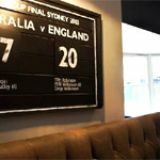 Rugby memorabilia – shirts, balls, photos – are on display and even some of the wallpaper and furniture fabric depicts the game. There’s a relatively large heated garden and function and conference rooms for hire. The pub’s other historical connection besides rugby is music. There’s a nightclub upstairs and it’s also the longstanding host both of Twickfolk (the Twickenham Folk Club) and the Eel Pie Rhythm and Blues Club. This latter is a continuation of a local tradition that started on nearby Eel Pie Island in the 1960s and has featured such legends as Ronnie Wood and Geno Washington. The pub has a split personality. On match days it’s predictably heaving with rugby fans and certainly not a place to go for a quiet drink. 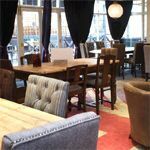 At other times it’s family friendly and welcomes a wide range of drinkers and diners, with a good gender mix. The live music and other events bring in their own followers. Big screens and loudish recorded music don’t make for an intimate atmosphere, though, and the place works better when full and lively. There’s a regular weekly quiz. The menu at the Cabbage Patch makes a feature of pizzas (from £6.30) but also stretches to pub grub staples like beef and ale pie (£8.95), sausage and mash (£7.95), spatchcock chicken (£11.95), vegetarian pasta or salmon fishcakes. It’s open for breakfast, there are £5 meal deals for weekday lunch, offers on pizzas and wine on Monday to Wednesday evenings, and a children’s menu at £5.25. The Cabbage Patch was previously tied to Heineken and the deal with Fuller’s has meant that unusually beers from both suppliers share space on an expanded range of handpumps. Besides London Pride, ESB and Fuller’s seasonal you’re likely to find several Caledonian beers such as Deuchars IPA, seasonals and specials, and guests from the likes of Brain’s – the latter no doubt to keep visiting Welsh fans happy. There’s a good range of 27 wines including several by the glass, some single malts and the standard keg beers and stouts. 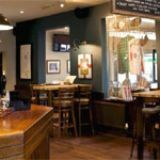 A must-visit for rugby and rhythm and blues fans, the Cabbage Patch should also appeal to those seeking a family friendly pub in the area, and the improved beer range following the Fuller’s takeover is a notable extra asset. Check the Twickenham fixtures calendar before you set out, though! As a venue for music, we didn't much like it. We could hear competing noise (loud music - maybe amplified, but definitely loud customers singing) from downstairs during the performance - and we were in the part of the audience very near the performer, as far away from the downstairs door as possible. The performer was bothered by that competing noise, too, and had to ask the sound guy to raise his music's volume to drown it out. The layout of upstairs was fine if you could sit within about 5 or 6 rows of the stage, which is where we luckily were. However, more seats were arranged in rows or 3 or 4 chairs paralleling the bar and running all the way back to the entrance door - maybe 10 more rows. They were not tiered back there and there was no way people a few rows or further back would ever have seen the performer. Finally, the show was supposed to start at 8 pm but the audience had to wait in the pub until the door was supposed to open at 8. However, the opening performer must have been late, so it didn't get started until about 8:30. The opener's performance was cut very short (literally, two songs) so the main perfomer could start and end presumably on time. Unclear whose fault these things were, but overall we felt a little short-changed. A nice pub for lunch & family friendly!! However don't go on a day that an event is being held!! Had Sunday lunch there after a cabbage patch sponsored charity run and had people changing and drying their armpits whilst we tried to eat - Not Good!!! !